Tom Julien, the original purchaser and developer of the Chateau St. Albain, gave a tour and historical lecture to the gathered CHARIS leaders. Here he points out some of the surrounding sites from the parapets atop the tower, which is about 50 feet above ground on the south side of the facility. In the mountain range in the background, Mont Blanc can be seen when the weather conditions are clear. To the right of Julien is his daughter Becky Schwan, who was raised in the chateau and is now living with her husband, David, in England. 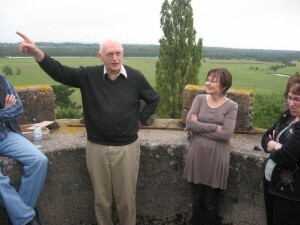 Tom Julien, who along with his wife, Doris, and the first of their three children came to France as Grace Brethren missionaries nearly 50 years ago, gave a guided tour of the Chateau St. Albain to the CHARIS leadership group this Wednesday afternoon. After several years of frustration when there were very little results from his traditional missionary methods, Julien began searching for a property where he could develop a ministry similar to that of Francis Schaeffer at L’Abri, whom Julien had come to know and appreciate. Eventually the Chateau was found, a massive, rundown concrete and stone facility on about four acres, dating back to the 14th century. Julien negotiated the sale and bought the property for Grace Brethren missions in 1964 for $28,000. Moving into the unheated, rustic facility, he began opening it to traveling young people and local youth who would come for evenings of discussion. Over the years the Chateau has been continually upgraded and improved, and now would be comparable to a two-star hotel and will house about 70 people. It is used widely by Christian groups as a conference center, and also has a strong presence in the Burgundy region as a place of Christian witness. Deb and Jay Hocking, from Winona Lake, Indiana, are now the on-site managers and hosts of the facility. The CHARIS group concluded Wednesday’s activity with a threefold communion service alternating languages between English, Spanish, Sango, and French. Took many a sun bath on top of that tower :).